The ghazal is an Arabic form of poetry in which the individual strophes, or stanzas, are poems themselves, islands--as it were--in a galaxy forming an integral habitude. 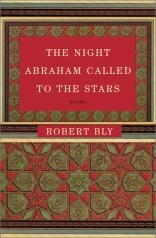 By definition, the ghazal is also a love poem, and it is the concept of love--the concept of two lovers--that is a pervasive theme of The Night Abraham Called to the Stars, a new collection of poems by Robert Bly. Of course, this new book demonstrates the wide variousness of the ghazal, hearkening back to the poet's own past as well as western cultural history, including Robespierre, Madame Bovary, Gustav Mahler, the etchings and paintings of Rembrandt, haystacks in the paintings of Claude Monet, lingering ruminations about the American Civil War and then World War I in Europe, and the difficult concept of separation, among many themes and variations. Our mothers took our hands in the spring field. That was the day we heard the cry of the hemlocks. We became lovers then; and our road was decided. We laughed and cried over the warmth of the spring. I could have taken on Henry James and Abelard. To engender the soft leaps of the cheetah. To be saved or murdered, has made me fierce. . . . The waterfall still holding the twig of reason. Since I am a man in love with the setting stars. Robert Bly's new collection of poems is rampant with the ecstasy of what it is to be a poet as well as one who constantly reads and travels, then dips into his experiences for imagery and associative correlations. This is a book of surprising gifts, emanating from the fertile, active imagination and intellect of a major American poet.